Kalmegh is known in several medicine systems for its exceptional ability to protect the liver, brain and heart; the 3 major organs of the body that embody the body, heart, spirit complex of shaman ritualistic medicine. But, more recently, in clinical trials, Kalmegh dramatically shortened duration and reduced the severity of colds! Just 3-6 grams of the dried herb daily when suffering from a cold, eaten raw or in a tea, showed a marked reduction in cold symptoms, whether eaten raw, or made into a tea. Kalmegh (Androphaugs paniculata) is used in traditional Siddha and Ayurvedic systems of medicine as well as in tribal medicine in India and some other countries for multiple clinical applications. Kalmegh is known for its exceptional ability to protect the liver, brain and heart; the 3 major organs of the body that embodify the body, heart, spirit complex of shaman ritualistic medicine. More recently, though, and quite interestingly, Kalmegh extract shortened duration and reduced symptoms of colds. Just 3-6 grams of the dried herb daily when suffering from a cold, in clinical trials, showed a marked reduction in cold symptoms, whether eaten raw, or made into a tea. In addition, the plant extract exhibits antityphoid and antifungal activities, and is also reported to possess antihepatotoxic, antibiotic, and antiinflammatory, properties to mention a few, besides its general use as an immunostimulant agent. A decoction of the plant is a blood-purifier. A. paniculata is an erect annual herb native to India, China, and Southeast Asia. The square stem has wings on the angles of new growth and is enlarged at the nodes, while the small flowers are borne on a spreading panicle. It is widely cultivated in Asia. The above-ground parts are collected in the fall. The genetic variability of the species has been examined. The herb has been used primarily for liver complaints and to reduce fevers in the traditional medicine of India and China, as well as for its bitter tonic properties. 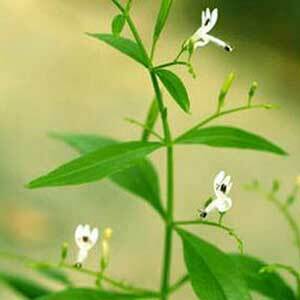 A large variety of Indian herbal patent medicines are available in which A. paniculata is a prominent ingredient. Kalmegh contains bitter principles andrographolide, a bicyclic diterpenoid lactone and Kalmeghin (upto 2.5%). The leaves contain the maximum active principle content while in the stem it is in lesser amount. Leaves are most often used.